The Hilton Short Hills is a wonderful venue for a bat mitzvah celebration. The Hilton has a variety of spaces and can even accommodate a bat mitzvah service, followed by a cocktail hour and reception without ever feeling cramped. The Hilton offers the added, obvious benefit of allowing the host to house their mitzvah guests in comfortable, luxurious rooms just upstairs from the celebration. 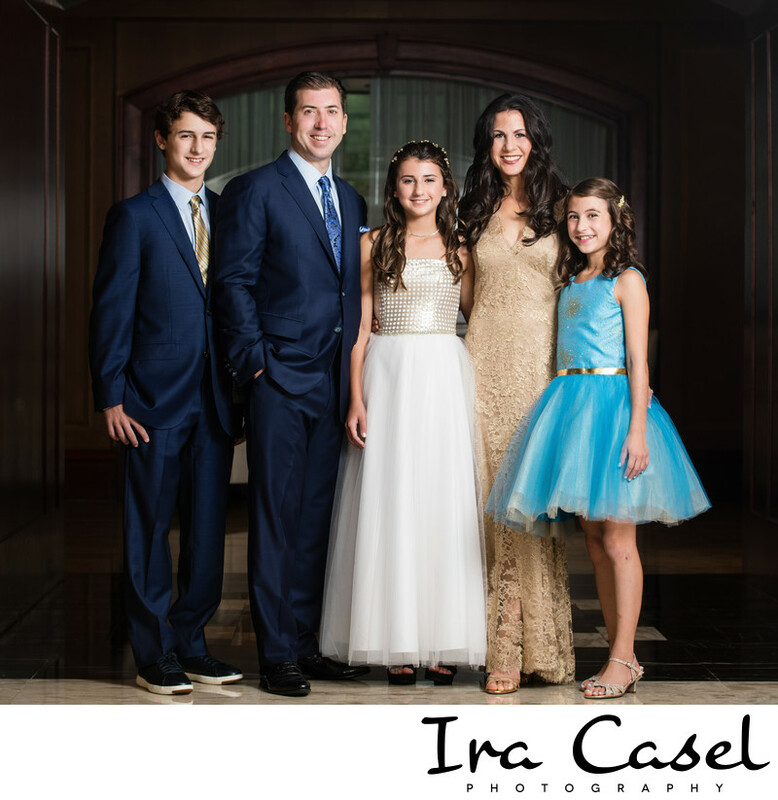 The warm weather date of this wonderful family's lovely middle daughter allowed them to make use of the Hilton's outdoor terrace space for both the bat mitzvah service and the adults' cocktail hour, where we did a few quick family portraits just before the service. This portrait of the family of five was made in the lobby which has several choice spots for posing portraits. The lobby's archways are one of my favorites, allowing for elegant framing around my subjects. The party, which took place in the lower level ballroom, was planned by the wonderfully talented Dayna Platnick, with Paris-themed decor executed by Jersey Street Productions. Entertainment was provided by Pure Event Group with the incomparable MC Gregg Mistretta at the helm all night. I've been honored to photograph two mitzvahs for this family and am looking forward to working with them when their youngest daughter becomes a bat mitzvah.